In this awesome crossover version of Brick Buster and Match 3, our magpie bird Reginald needs your help to collect as many shining objects as possible! Increase your score by collecting the biggest chains of diamonds, gold, silver, and other jewels. Just be careful not to run out of moves and let this clever bird down--do your best to give him as much “bling” as you can! To increase your score, you need to collect as many jewels as possible within the 100 moves limit. Remember that bigger chains give you more points! 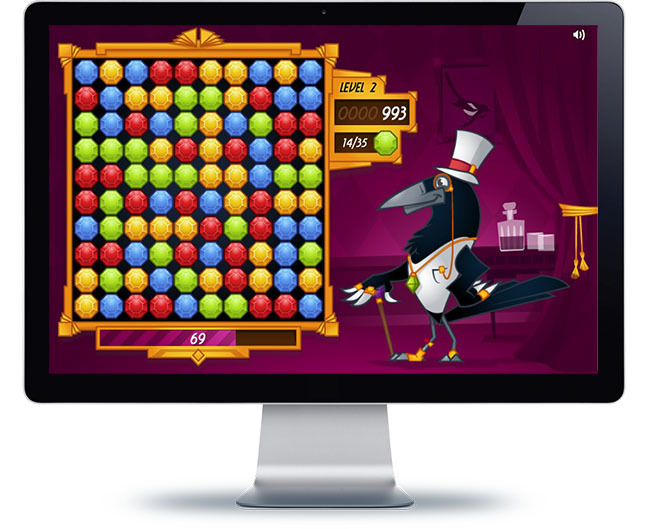 The faster you collect the gems, the higher your score will be because you go into a “Dazzle Mode”, which doubles your points. In order to level up, you have to collect the required number of a specific coloured gem. You can check your target in the right side of the field.